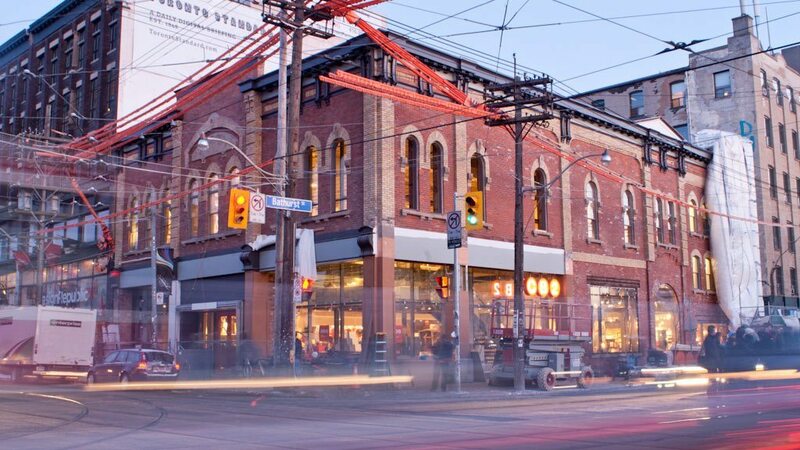 An advance look at the beautifully restored building at Queen and Bathurst, which re-opens as furniture store CB2 on Saturday. WHAT: For two years, the building that once housed the Big Bop has been shuttered: first a forlorn, fading purple reminder of the shows we’d inevitably been to, then a tarp-covered mystery renovation. Those renovations were in anticipation of the new tenant, mass furniture behemoth Crate and Barrel, which would be installing a location of its younger, cheaper offshoot, CB2—and they are a mystery no longer. As much a restoration as a renovation, the building at the corner of Queen and Bathurst is a sharp reminder that Toronto has a lot of architecture worth saving, much of which is hidden in plain site. Under the gaudy paint was stunning brickwork and, dare we say, a great deal of elegance worth celebrating. CB2 launches tonight with an invitation-only party, but we were able to walk around yesterday and get a sneak peek at the spruced-up interiors. Doors open to the public at 10 a.m. Saturday morning.